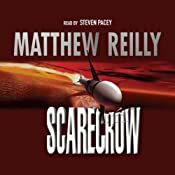 Steven Pacey read five abridged Matthew Reilly books onto audio and, more recently, the entire abridged Jack West Series. 4500 years ago, a magnificent golden capstone sat at the peak of the Great Pyramid of Giza. It was a source of immense power, reputedly capable of bestowing upon its holder absolute global power. But then it was divided into seven pieces and hidden, each piece separately, within the seven greatest structures of the age. Now it’s 2006 and the coming of a rare solar event means it’s time to locate the seven pieces and rebuild the capstone. Everyone wants it – from the most powerful countries on Earth to gangs of terrorists and one daring coalition of eight small nations. Led by the mysterious Captain Jack West Jr, this determined group enters a global battlefield filled with booby-trapped mines, crocodile-infested swamps, evil forces and an adventure beyond imagining. 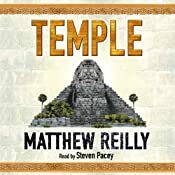 After their thrilling exploits in Matthew Reilly’s bestseller Seven Ancient Wonders, super-soldier Jack West and his loyal team of adventurers are back, and now they face an all-but impossible challenge. For a mysterious ceremony in an unknown location has triggered a catastrophic countdown that will climax in the destruction of all life on Earth. But there is one last hope. If Jack’s team can find and rebuild a legendary ancient device known only as the “Machine”, they might be able to ward off this coming Armageddon. The only clues to its location, however, are held within the fabled Six Sacred Stones, long lost in the fog of history. And so the hunt begins . . . From Stonehenge in England, to the deserts of Egypt, to the spectacular Three Gorges region of China, The Six Sacred Stones will take you on a non-stop rollercoaster ride through ancient history, modern military hardware, and some of the fastest and most mind-blowing action you will ever read. 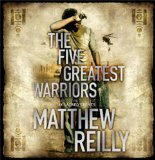 Steven’s reading of The Five Greatest Warriors was longlisted for the Sounds of Crime Awards, 2011. At a remote US ice station in Antarctica, a team of scientists has made an amazing discovery. They have found something unbelievable buried below the surface, trapped inside a layer of ice 400 million years old. Something made of metal…something which shouldn’t be there…it’s the discovery of a lifetime, a discovery of immeasurable value. And a discovery men would kill for. 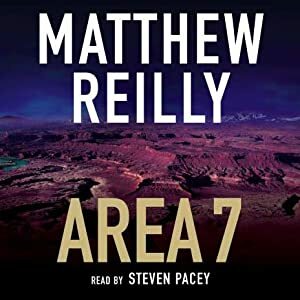 Led by the enigmatic Lieutenant Shane Schofield, a crack team of US Marines is rushed to the ice station to secure this bizarre discovery for their own nation. Meanwhile, other countries have the same idea and are ready to pursue it swiftly and ruthlessly. Fortunately, Schofield’s men are a tough unit, all set to follow their leader into hell. They soon discover that they just have. It is America’s most secret base, hidden deep in the Utah desert, an Air Force installation known only as Area 7. And today it has a visitor: the president of the United States. He has come to inspect Area 7, to examine its secrets for himself. But he’s going to get more than he bargained for on this trip – because hostile forces are waiting inside. Among the president’s helicopter crew, however, is a young Marine. He is quiet, enigmatic, and he hides his eyes behind a pair of silver sunglasses. His name is Schofield. Call-sign: Scarecrow. Rumour has it, he’s a good man in a storm. Judging by what the president has just walked into, he’d better be. 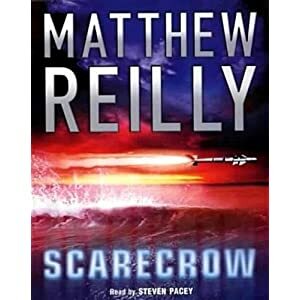 As “Scarecrow” Schofield watches his mission turn into a bloodbath, he realises he has been tricked – and that now he’s become the prey rather than the predator. For a shadowy consortium of staggering power and wealth has included his name on a list of 15 targets to be eliminated without fail by 12 noon that same day. Now, every high-powered bounty hunter on the planet is on his trail, while he must simultaneously track down the perpetrators of a conspiracy about to reduce many of the major cities of the world to ashes. From Arctic Russia to the Afghan border, to France’s Atlantic Coast, to a speed-of-light conflict over the Suez Canal, every form of ultra-tech weaponry comes into play in a spellbinding action drama unfolding within a mere 24 hours. The New York Public Library looms as a silent sanctuary of knowledge: a hundred-year-old labyrinth of towering bookcases, narrow aisles, and spiral staircases. But for Dr Stephen Swain and his eight-year-old daughter, Holly, it is a place of nightmare. 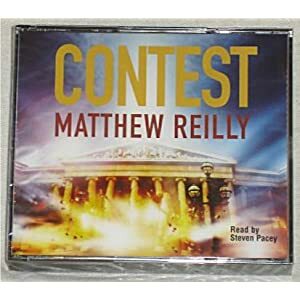 Because, for just one night, this historic building is to become the venue for a horrifying alien contest, a contest in which Swain must compete, whether he likes it or not. The rules of the challenge are simple: seven contestants will enter, but only one will leave. With his daughter in his arms, Stephen Swain is plunged into a terrifying fight for survival. The stakes are high, the odds are brutal. He can choose to run, to hide, or to fight. But if he wants to live, he needs to win – for in this particular contest, unless you leave as victor, you do not leave at all. It’s a race to locate a legendary Incan idol: one carved out of a strange kind of stone. But a stone which, in the present age, could be used as the basis for a terrifying new weapon. The US Army wants this prize at any cost. But they are not alone. 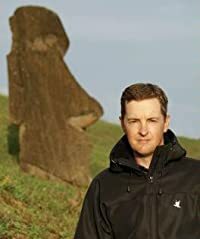 The only clue to the idol’s final resting place is to be found in a 400-year-old manuscript – which introduces Professor William Race, a mild-mannered but brilliant young linguist, who is unwillingly recruited to interpret the document that could lead the US team to the idol itself. So begins the mission that will lead Race and his armed companions to a mysterious stone temple hidden in the foothills of the Andes. This is a carefully contrived sanctuary seething with menace and unexpected dangers. But it is not until the silence of the temple is breached that Race and his team discover they have broken a golden rule….Some doors are meant to remain unopened.